This year hinted at the dawn of a new era in U.S. men's tennis. It's too soon to write off doubles stars Bob and Mike Bryan, even at age 37. If Daniel Nestor can play at 43 and Leander Paes at 42, so can the Bryans if they so desire. But the former Stanford All-Americans endured their worst season in more than a decade in 2015. Meanwhile, Taylor Fritz led a surge of promising American teenagers with back-to-back Challenger titles in Northern California. Collin Altamirano, 20-year-old Sacramento resident -- No. 818 in singles (-1), 964 in doubles (+3). Bob Bryan, 37-year-old former Stanford star, part-time member of Sacramento-based California Dream in World TeamTennis in 2015 -- No. 4 in doubles (no change), unranked in singles. Mike Bryan, 37-year-old former Stanford star, part-time member of Dream in 2015 -- No. 5 in doubles (no change), unranked in singles. Bradley Klahn, 25-year-old former Stanford star -- No. 513 in singles (no change), No. 752 in doubles (-2). Mackenzie McDonald, 20-year-old resident of Piedmont in San Francisco Bay Area -- Career-high No. 371 in singles (+1), No. 547 in doubles (no change). Dennis Novikov, 22-year-old resident of Milpitas in San Francisco Bay Area -- No. 150 in singles (no change), No. 179 in doubles (no change). Tennys Sandgren, 24-year-old member of California Dream -- No. 261 in singles (+2), No. 194 in doubles (+1). Matt Seeberger, 31-year-old San Francisco native and former UC Santa Cruz star -- No. 161 in doubles (no change). Neal Skupski, 25-year-old member of California Dream -- No. 102 in doubles (+1). Dmitry Tursunov, 33-year-old resident of Folsom in Sacramento area -- No. 258 in doubles (no change). Kristie Ahn, 23-year-old former Stanford star -- No. 207 in singles (no change), No. 411 in doubles (+2). CiCi Bellis, 16-year-old resident of Atherton in San Francisco Bay Area -- No. 233 in singles (-2). Alexandra Facey, 22-year-old product of Cameron Park in Sacramento area -- No. 629 in doubles (-7). Kat Facey, 22-year-old product of Cameron Park in Sacramento area -- No. 629 in doubles (-7). Jarmila Gajdosova, 28-year-old member of California Dream (2015) -- No. 105 in singles (no change), No. 144 in doubles (no change). Nicole Gibbs, 22-year-old former Stanford star -- No. 109 in singles (no change), career-high No. 171 in doubles (no change). Michaela Gordon, 16-year-old resident of Saratoga in San Francisco Bay Area -- No. 660 in singles (-1), No. 861 in doubles (+1). Raquel Atawo (formerly Kops-Jones), 33-year-old San Jose resident and former Cal star -- No. 18 in doubles (no change). Maegan Manasse, 20-year-old Cal junior -- No. 529 in doubles (-4), No. 757 in singles (-1). Maria Sanchez, 26-year-old Modesto product -- No. 86 in doubles (no change), No. 193 in singles (no change). Carol Zhao, 20-year-old Stanford junior -- No. 193 in doubles (+1), No. 343 in singles (no change). Through Saturday -- USTA National Winter Championships, boys and girls 18 and 16 singles and doubles, Scottsdale, Ariz. Through Saturday -- USTA National Winter Championships, boys and girls 14 and 12 singles and doubles, Tucson, Ariz.
Jan. 21-31 -- Les Petits As (boys and girls 12-14), Tarbes, France. April 2-10 -- Easter Bowl, Indian Wells. April 16-17 -- Fed Cup semifinals. Unseeded Ajai Shekhera of Campbell surprised No. 4 Richard Ciamarra of Southington, Conn., 7-6 (2), 2-6, 6-1 today to reach the boys 18 quarterfinals in the USTA National Winter Championships in Scottsdale, Ariz.
Shekhera has beaten three straight seeds in the tournament. He knocked off No. 17 Keanu Ellen of Lahaina, Hawaii, in the second round and No. 11 Joseph Rotheram of Manhattan Beach in the third round. Joining Shekhera in the boys 18 quarters are No. 8 Austen Huang of Elk Grove and No. 17 Paul Barretto of Tiburon. The only other NorCal boy left in singles in the tournament is No. 1 Stefan Leustian of Mather in the 14s. Five NorCal girls reached the quarterfinals in their respective age groups: No. 1 Sara Choy of Palo Alto and No. 8 Carolyn Campana of Hillsborough in the 16s, No. 1 Katie Volynets of Walnut Creek and No. 2 Jillian Taggart of Fair Oaks in the 14s, and No. 5 Yuu Ishikawa of Mountain View in the 12s. Union City's Rachel Eason, seeded fourth in the girls 16s, lost to unseeded Sedona Gallagher of Henderson, Nev., 6-1, 1-6, 6-2. The boys and girls 18s and 16s are being played in Scottsdale, and the 14s and 12s are being held in Tucson, Ariz.
Paul Barretto (17), Tiburon, def. Brandon Lam (17), Westlake Village, 6-2, 6-1. Ajai Shekhera, Campbell, def. Richard Ciamarra (4), Southington, Conn., 7-6 (2), 2-6, 6-1. Austen Huang (8), Elk Grove, def. Jarod Hing (16), Paradise Valley, Ariz., 6-1, 6-2. Jared Pratt (17), Daniel Island, S.C., def. Arjith Jayaraman, Gold River, 6-3, 7-5. Stefan Leustian (1), Mather, def. Justin Mandell, Harrison, N.Y., 7-5, 6-2. Zummy Bauer, Suwanee, Ga., and Andrew Ton (1), Milpitas, def. Hayden Cassone, South Salem, N.Y., and Carson Haskins (5), Ballwin, Mo., 3-6, 6-0 [10-7]. Robert Cash and Joel Jose (4), New Albany, Ohio, def. Stefan Dostanic, Irvine, and Aditya Gupta (6), Los Altos, 6-3, 6-1. Stefan Leustian, Mather, and Zachery Lim (7), Fairfield, def. Connor Fu, Andover, Mass., and Hunter Heck (2), New Brighton, Minn., 7-5, 6-7 (6) [10-6]. Tali Jarmond, Charlotte, N.C., and Braden Shick, Greensboro, N.C., def. Max Fardanesh, Albany, and Jake Vassel, Danville, 3-6, 7-5 [10-8]. Sara Choy (1), Palo Alto, def. Jayci Goldsmith (13), Dripping Springs, Texas, 6-2, 6-3. Sedona Gallagher, Henderson, Nev., def. Rachel Eason (4), Union City, 6-1, 1-6, 6-2. Carolyn Campana (8), Hillsborough, def. Emilee Duong, Placentia, 7-5, 6-3. Katie Volynets (1), Walnut Creek, def. Rosie Garcia Gross (17), New York, 6-2, 6-2. Jillian Taggart (2), Fair Oaks, def. Olivia McIntosh-Adams, Los Angeles, 6-2, 6-0. Yuu Ishikawa (5), Mountain View, def. Matilyn Wang (17), Scottsdale, Ariz., 6-1, 6-1. Katrina Scott (2), Woodland Hills, def. Vivian Ovrootsky (13), San Jose, 6-2, 7-5. Hind Abdelouahid, San Jose, and Diana Wong, Hilo, Hawaii, def. Jessica Anzo, Temecula, and Isabella Lorenzini, Clarendon Hills, Ill., 7-5, 6-3. Daniela Bellini, Tierra Verde, Fla., and Imani Graham, Saint Johns, Fla., def. Carolyn Campana, Hillsborough, and Madison Hwang (1), Frisco, Texas, 2-6, 6-1 [10-6]. Gabriella Price, Montebello, N.Y., and Katie Volynets (2), Walnut Creek, def. AnneMarie Hiser, Acworth, Ga., and Winslow Huth (5), Brentwood, Tenn., 6-1, 6-2. Soren Leichter, Carmel, Ind., and Madison Sieg (1), Greenwich, Conn., def. Vivian Ovrootsky, San Jose, and Makenna Thiel (9), Piedmont, 3-6, 7-6 (4) [10-2]. Zoe Hammond, Edmond, Okla., and Caroline Wernli (3), Austin, Texas, def. Yuu Ishikawa, Mountain View, and Katja Wiersholm (5), Kirkland, Wash., 7-6 (4), 2-6 [10-8]. the USTA National Winter Championships. No. 6 seed Camille Favero of Sacramento lost to No. 17 Annette Goulak of Oak Park 6-7 (3), 6-4, 7-6 (1) today in the third round of the girls 18s in the USTA National Winter Championships in Scottsdale, Ariz.
Northern California's other remaining girl in 18 singles, No. 17 Darya Possokhova of San Francisco, fell to No. 9 Jessica Failla of Ramona 2-6, 6-2, 6-3. Three NorCal boys, however, reached the round of 16 in the 18s. Advancing were No. 8 Austen Huang of Elk Grove, No. 17 Paul Barretto of Tiburon and unseeded Ajai Shekhera of Campbell. Shekhera upset No. 11 Joseph Rotheram of Manhattan Beach 6-2, 4-6, 6-3. Barretto won the boys 18 title in the NorCal Junior Sectional Championships in Sacramento in June. The 18s and 16s are being played in Scottsdale, and the 14s and 12s are being contested in Tucson, Ariz.
Austen Huang (8), Elk Grove, def. Dylan King (17), Portland, Ore., 6-3, 6-1. Paul Barretto (17), Tiburon, def. Michael Lee, Tucson, Ariz., 6-2, 6-0. Ajai Shekhera, Campbell, def. Joseph Rotheram (11), Manhattan Beach, 6-2, 4-6, 6-3. Connor Hance (2), Torrance, def. Jayson Fung, San Francisco, 6-1, 6-3. Carson Haskins (1), Ballwin, Mo., def. Jenson Brooksby (17), Carmichael, 6-0, 6-4. Arjith Jayamaran, Gold River, def. Jack Katzman, Seattle, 6-2, 6-4. Stefan Leustian (1), Mather, def. JC Roddick, San Antonio, 1-6, 7-5, 6-2. Justin Mandell, Harrison, N.Y., def. Mason Fung, San Francisco, 6-3, 6-2. Jerry Wang (6), Fayetteville, N.C., def. Brandon Aprill, Mountain View, 6-2, 6-2. Harry Yang (3), Arcadia, def. Aidan Mayo (17), Roseville, 7-5, 6-3. Andrew Dale (5), Leesburg, Va., def. Zachery Lim (17), Fairfield, 6-3, 6-1. Pierce Rollins, Tulsa, Okla., def. Aditya Gupta (17), Los Altos, 6-4, 1-6, 7-6 (6). Nishesh Basavareddy (3), Carmel, Ind., def. Alexander Chang (17), Berkeley, 6-1, 6-1. Zummy Bauer, Suwanee, Ga., and Andrew Ton (1), Milpitas, def. William Grattan-Smith and Garrett Johns, Atlanta, 6-0, 6-1. Stefan Dostanic, Irvine, and Aditja Gupta (6), Los Altos, def. Logan Paik Chang, Old Westbury, N.Y., and Derek Raskopf (9), New York, 7-5, 6-1. Stefan Leustian, Mather, and Zachery Lim (7), Fairfield, def. Keshav Chopra, Marietta, Ga., and Alex Lee (9), Oak Brook, Ill., 6-4, 7-6 (6). Nishesh Basavareddy, Carmel, Ind., and Alan Jesudason (1), Berwyn, Pa., def. Alexander Chang, Berkeley, and Luke Neal, Oakland, 3-6, 6-3 [11-9]. Max Fardanesh, Albany, and Jake Vassel, Danville, def. Noah Zamora, San Diego, and Learner Tien, Irvine, 6-2, 5-7 [10-7]. Annette Goulak (17), Oak Park, def. Camille Favero (6), Sacramento, 6-7 (3), 6-4, 7-6 (1). Jessica Failla (9), Ramona, def. Darya Possokhova (17), San Francisco, 2-6, 6-2, 6-3. Sara Choy (1), Palo Alto, def. Maia Sung, Rolling Hills, 2-6, 6-3, 6-1. Rachel Eason (4), Union City, def. Vivian Cheng (17), Santa Monica, 6-2, 6-2. Sedona Gallagher, Henderson, Nev., def. Ashley Yeah (16), Los Gatos, 6-1, 6-7 (6), 6-3. Carolyn Campana (8), Hillsborough, def. Somer Henry, Franklin, Tenn., 6-2, 7-6 (6). Katie Volynets (1), Walnut Creek, def. Audrey Boch-Collins (17), Las Vegas, 7-6 (6), 6-3. Gabriella Price (4), Montebello, N.Y., def. Stephanie Nguyen (17), Fremont, 6-2, 6-2. Jillian Taggart (2), Fair Oaks, def. Macey Miller (17), Norman, Okla., 6-1, 6-1. Christine Canete (3), Los Angeles, def. Angelica AksdalJansen, San Francisco, 6-0, 6-0. Yuu Ishikawa (5), Mountain View, def. Sonya Macavei, Loveland, Ohio, 6-1, 6-0. Bridget Stammel (4), Dallas, def. Makenna Thiel (17), Piedmont, 6-3, 6-4. Vivian Ovrootsky (13), San Jose, def. Filippa Bruu-Syversen (17), Chatham, N.J., 6-3, 7-5. Hind Abdelouahid, San Jose, and Diana Wong, Hilo, Hawaii, Alyssa Hahn, Richmond, Va., and Nina Sorkin, Glen Allen, Va., 6-4, 2-6 [10-7]. Carolyn Campana, Hillsborough, and Madison Hwang (1), Frisco, Texas, def. Page Freeman, Ashland, Mass., and Cayla Koch, Weston, Conn., 6-3, 7-5. Dasha Kourkina, Brooklyn, N.Y., and Michelle Sorokko (3), Little Neck, N.Y., def. Sara Choy, Palo Alto, and Salma Ewing, Long Beach, 7-5, 6-1. Abigail Forbes, Raleigh, N.C., and Alexis Merrill (10), Fairfax, Va., def. Julia Lilien, Scottsdale, and Niluka Madurawe (9), Sunnyvale, 6-4, 6-3. Julia Haynes, San Diego, and Rena Lin, Northridge, def. Jessica Aragon, Plano, Texas, and Rachel Eason (13), Union City, 6-1, 7-5. Gabriella Price, Montebello, N.Y., and Katie Volynets (2), Walnut Creek, def. Fiona Crawley, San Antonio, and Kiana Graham (9), Austin, Texas, 6-2, 3-6 [10-8]. Vivian Ovrootsky, San Jose, and Makenna Thiel (9), Piedmont, def. Whitley Pate, Winston-Salem, N.C., and Sophia Strugnell (7), Summerfield, N.C., 7-6 (2), 7-5. Yuu Ishikawa, Mountain View, and Katja Wiersholm (5), Kirkland, Wash., def. Kailey Evans, Ennis, Texas, and Katherine Wurster, Wichita Falls, Texas, 4-6, 6-2 [11-9]. Three No. 1 seeds from Northern California have reached the third round of their respective junior age groups in the USTA National Winter Championships in Scottsdale, Ariz., and Tucson, Ariz. Advancing on Monday to the round of 32 were Sara Choy of Palo Alto in the girls 16s, Stefan Leustian of Mather in the boys 14s and Katie Volynets of Walnut Creek in the girls 14s. Milpitas' Andrew Ton, seeded 10th in the boys 16s, lost to Diego Nava of Woodland Hills 7-6 (5), 6-4. The 18s and 16s are being played in Scottsdale, and the 14s and 12s are being contested in Tucson. 18 -- Austen Huang (8), Elk Grove; Paul Barretto (17), Tiburon; Ajai Shekhera, Campbell; Jayson Fung, San Francisco. 16 -- Jenson Brooksby (17), Carmichael; Arjith Jayamaran, Gold River. 14 -- Stefan Leustian (1), Mather; Aidan Mayo (17), Roseville; Zachery Lim (17), Fairfield; Aditya Gupta (17), Los Altos; Mayson Fung, San Francisco; Brandon Aprill, Mountain View. 12 -- Alexander Chang (17), Berkeley. 18 -- Camille Favero (6), Sacramento, Darya Possokhova (17), San Francisco. 16 -- Sara Choy (1), Palo Alto; Rachel Eason (4), Union City; Carolyn Campana (8), Hillsborough; Ashley Yeah (16), Los Gatos. 14 -- Katie Volynets (1), Walnut Creek; Jillian Taggart (2), Fair Oaks; Stephanie Nguyen (17), Fremont. 12 -- Yuu Ishikawa (5), Mountain View; Vivian Ovrootsky (13), San Jose; ; Makenna Thiel (17), Piedmont; Angelica AksdalJansen, San Francisco. The recent Orange Bowl and Junior Orange Bowl weren't exactly encouraging for the United States. The U.S. failed to win any of the eight singles titles in the prestigious Florida tournaments. Argentina took three crowns, Ukraine two, and Serbia, Canada and China one each. The Orange Bowl consisted of boys and girls 18 and 16 singles and doubles on clay in Plantation, Fla. The Junior Orange Bowl was comprised of boys and girls 14 and 12 singles only on clay and hardcourts in Coral Gables, Fla.
Only two Americans, both girls from the West, reached a singles final. Sixth-seeded Kayla Day of Santa Barbara, Calif., lost in the 18s, and ninth-seeded Naomi Cheong of Las Vegas fell in the 14s. At least Americans won one doubles crown as unseeded McCartney Kessler of Calhoun, Ga., and Emma Kurtz of Atlanta prevailed in the girls 16s. The only other U.S. finalist was Brian Shi of Jericho, N.Y. He and Nicaise Muamba of Canada lost in boys 16 doubles as the second seeds. Miomir Kecmanovic (9), Serbia, def. Stefanos Tsitsipas (3), Greece, 6-3, 2-6, 7-6 (5). Yuta Shimizu and Yunosuke Tanaka, Japan, def. Ergi Kirkin, Turkey, and Alexei Popyrin, Australia, 7-5, 7-6 (2). Sebastian Baez (9), Argentina, def. Karl Friberg (3), Sweden, 6-2, 6-1. Sebastian Baez, Argentina, and Miguel Fernando Pereira (3), Chile, def. Nicaise Muamba, Canada, and Brian Shi (2), Jericho, N.Y., 6-2, 6-3. Bianca Andreescu (9), Canada, def. Kayla Day (6), Santa Barbara, 7-6 (7), 6-4. Pranjala Yadlapalli, India, and Tamara Zidansek (5), Slovenia, def. Eleni Christofi, Greece, and Anastasia Detiuc, Moldova, 6-2, 6-2. Maria Carle (2), Argentina, def. Gabriela Tatarus, Romania, 6-2, 7-6 (7). McCartney Kessler, Calhoun, Ga., and Emma Kurtz, Atlanta, def. Ania Hertel, Poland, and Mihaela Marculescu (4), Romania, 6-3, 4-6 [10-6]. Thiago Tirante (1), Argentina, def. Anton Matusevich (17), Great Britain, 6-2, 6-2. Xiaofei Wang (1), China, def. Jewon Jeon (8), South Korea, 6-1, 6-2. Marta Kostyuk (5), Ukraine, def. Naomi Cheong (9), Las Vegas, 6-3, 6-4. Daria Lopatetska (7), Ukraine, def. Noa Krznaric (1), Croatia, 7-5, 6-0. Aidan Mayo faced a seed for the third straight match on Sunday in the Junior Orange Bowl. Mayo, from Roseville in the Sacramento area, fell to No. 1 Xiaofei Wang of China 7-6 (4), 6-4 in the boys 12 quarterfinals in Coral Gables, Fla. The 12-year-old Mayo, last year's consolation champion, had beaten No. 9 Ashton Cross of Canada and No. 7 Benjamin Kittay of Potomac, Md. Mayo's brother, Keenan, reached the boys 16 doubles semifinals in the recent Orange Bowl in Plantation, Fla.
Past competitors in the Junior Orange Bowl include Andre Agassi, Jim Courier, Andy Roddick, Juan Martin Del Potro, Chris Evert, Monica Seles, Justine Henin, Kim Clijsters and Mary Joe Fernandez. Aidan Mayo of Roseville in the Sacramento area knocked off a seed for the second straight match to reach the boys 12 quarterfinals of the Junior Orange Bowl in Coral Gables, Fla.
Mayo, 12, defeated No. 7 Benjamin Kittay of Potomac, Md., 6-3, 6-2 on Saturday to set up a showdown with No. 1 Xiaofei Wang of China. Wang beat Martin Damm, a 6-foot-2 left-hander from Bradenton, Fla., 7-5, 6-1. Damm's father, a Czech also named Martin, reached career highs of No. 42 in singles in 1997 and No. 5 in doubles in 2007. He won the men's doubles title in the 2006 U.S. Open with Leander Paes of India. Mayo, who ousted No. 9 Ashton Cross of Canada in the third round, has not lost a set in four matches. Wang has dropped one match. In the fourth round of the girls 14s, No. 4 seed Katie Volynets of Walnut Creek in the San Francisco Bay Area lost to No. 9 Oana Corneanu of Romania 6-1, 7-5. Volynets, whose parents emigrated from Ukraine 19 years ago, will turn 14 on Dec. 31. Corneanu, a hard-hitting left-hander, celebrated her 14th birthday on June 25. Aidan Mayo of Roseville in the Sacramento area upset ninth-seeded Ashton Cross of Canada 6-4, 6-4 on Friday in the third round of the boys 12s in the Junior Orange Bowl in Coral Gables, Fla.
Mayo, last year's consolation champion, is scheduled to meet seventh-seeded Benjamin Kittay of Potomac, Md., today for a quarterfinal berth. Kittay dismissed qualifier Evan Wen of Morristown, N.J., 6-2, 6-2. Mayo is the 12-year-old brother of Keenan Mayo, who reached the boys 16 doubles semifinals in last week's Orange Bowl in Plantation, Fla.
Also advancing to the round of 16 in the Junior Orange Bowl was fourth-seeded Katie Volynets of Walnut Creek in the San Francisco Bay Area in the girls 14s. Volynets, last year's USTA girls 12 national champion, thrashed wild card Elli Mandlik of Boynton Beach, Fla., 6-2, 6-0. Volynets, whose parents emigrated from Ukraine 19 years ago, will face ninth-seeded Oana Corneanu of Romania today for a spot in the quarters. Corneanu defeated Himeno Sakatsume of Japan 6-4, 7-5. Stefan Leustian of Mather in the Sacramento region lost to Jung Won Park of South Korea 6-1, 6-1 in the fourth round of the boys 14s. The California Dream could be one-and-done. Sacramento's World TeamTennis franchise appears to be in financial trouble after its inaugural season in July, The Sacramento Bee reported on Thursday. Randy Peters Catering, the Dream's concessionaire, sued the team this week for allegedly failing to pay a $19,000 bill. The Dream faces an uncertain future, part-owner Bob Kaliski told The Bee. "I don't know if the team is going to be back or not," said Kaliski, adding that he lost $175,000 investing in the team. "I know I'm not going to be back. I don't know about the rest of the team." The Dream's other two owners, Jeff Launius and Mike Malone, could not be reached for comment. The team's phone number and Launius' cell number are out of service. WTT spokeswoman Rosie Crews told The Bee that Launius has until the end of the month to meet the financial commitments for the Dream to return next season. California averaged an announced 1,291 fans for seven home matches in its 2,400-seat temporary stadium in the Sacramento suburb of Citrus Heights. Other than for the only home appearance by doubles stars Bob and Mike Bryan, attendance was often sparse. California won six of its last seven regular-season matches to finish second in the Western Conference at 9-5, then lost to the host Austin Aces in the conference final. The Dream, formerly the Texas Wild in the Dallas area, brought WTT back to the Sacramento region after a one-year absence. The Sacramento Capitals announced in February 2014 that they were moving to Las Vegas after 28 years and a record six league titles because the team lacked a permanent tennis facility. Four weeks later, WTT disbanded the franchise when team owner Deepal Wannakuwatte was jailed on charges of defrauding investors in his medical supply business of $109 million. He was sentenced to 20 years in prison. Former Capitals co-owner Lonnie Nielson pleaded guilty to grand theft related to his real estate business in 2010 and was released from prison in 2013. The other owner with Nielson, Sacramento real estate developer Bob Cook, declared bankruptcy after the 2011 season. Three Northern Californians reached today's round of 32 in the Junior Orange Bowl in Coral Gables, Fla.
Fourth-seeded Katie Volynets of Walnut Creek in the San Francisco Bay Area defeated Jada Bui of Canada 6-1, 7-5 on Thursday in the second round of the girls 14s. Stefan Leustian of Mather in the Sacramento area ousted 17th-seeded Admir Kalender of Croatia 2-6, 6-4, 7-6 (tiebreaker score not available) in the third round of the boys 14s. And Aidan Mayo of Roseville in the Sacramento region beat Credit Chaiyarin of Thailand 6-1, 6-4 in the second round of the boys 12s. Mayo, last year's consolation champion, will face ninth-seeded Ashton Cross of Canada. Past competitors in the Junior Orange Bowl include Andre Agassi, Jim Courier, Andy Murray, Andy Roddick, Juan Martin Del Potro, Chris Evert, Monica Seles, Justine Henin, Kim Clijsters and Mary Joe Fernandez. Two Northern California juniors lost in the doubles semifinals on Saturday in the Orange Bowl in Plantation, Fla.
Michaela Gordon, 16, of Saratoga in the San Francisco Bay Area and Jaqueline Cristian of Romania fell to Eleni Christofi of Greece and Anastasia Detiuc of Moldova 6-4, 7-5 in a girls 18 matchup of unseeded teams in the prestigious clay-court tournament. Unseeded Keenan Mayo of Roseville in the Sacramento region and Trey Hilderbrand of San Antonio lost to third-seeded Sebastian Baez of Argentina and Miguel Fernando Pereira of Chile 6-1, 3-6 [10-5] in the boys 16s. Mayo and Hilderbrand had ousted the top seeds (Jonas Eriksson Ziverts and Karl Friberg of Sweden) in the second round and the fifth seeds (Juan Ignacio Batalla Diez of Mexico and Sergio Luis Hernandez Ramirez of Colombia) in the quarterfinals. Mayo trains at the USTA center in Carson in the Los Angeles area. The only American singles finalist is sixth-seeded Kayla Day of Santa Barbara in the girls 18s. Miomir Kecmanovic (8), Serbia, def. Calin Manda, Romania, 6-4, 6-2. Stefanos Tsitsipas (3), Greece, def. Mate Valkusz (2), Hungary, 6-3, 6-1. Yuta Shimizu and Yunosuke Tanaka, Japan, def. Oliver Crawford, Spartanburg, S.C., and Jack Mingjie Lin, Canada, 7-6 (6), 6-3. Ergi Kirkin, Turkey, and Alexei Popyrin, Australia, def. Youssef Hossam, Egypt, and Alberto Lim (5), Philippines, 6-7 (6), 6-3 [13-11]. Karl Friberg (3), Sweden, def. Nicolas Mejia, Colombia, 6-2, 6-3. Sebastian Baez (9), Argentina, def. Kyrylo Tsygura (16), North Potomac, Md., 6-4, 6-4. Sebastian Baez, Argentina, and Miguel Fernando Pereira (3), Chile, def. Trey Hilderbrand, San Antonio, and Keenan Mayo, Roseville, 6-1, 3-6 [10-5]. Nicaise Muamba, Canada, and Brian Shi (2), Jericho, N.Y., def. Andrew Fenty, Washington, D.C., and Tristan McCormick (4), Berwyn, Pa., 7-6 (5), 3-6 [14-12]. Kayla Day (6), Santa Barbara, def. Anastasia Potapova (13), Russia, 5-7, 6-3, ret. Bianca Andreescu (9), Canada, def. Dalma Galfi (2), Hungary, 2-6, 6-4, 6-2. Eleni Christofi, Greece, and Anastasia Detiuc, Moldova, def. Jaqueline Cristian, Romania, and Michaela Gordon, Saratoga, 6-4, 7-5. Pranjala Yadlapalli, India, and Tamara Zidansek (5), Slovenia, def. Sofia Kenin, Pembroke Pines, Fla., and Ingrid Neel (4), Rochester, Minn., 6-4, 2-6 [10-7]. Gabriela Tatarus, Romania, def. Lea Ma, Dix Hills, N.Y., 6-2, 6-1. Maria Carle (2), Argentina, def. Hannah Lairmore, Mobile, Ala., 6-1, 6-1. Ania Hertel, Poland, and Mihaela Lorena Marculescu (4), Romania, def. Hannah Lairmore, Mobile, Ala., and Alana Wolfberg, Orlando, Fla., 6-7 (4), 7-6 (4) [10-8]. McCartney Kessler, Calhoun, Ga., and Emma Kurtz, Atlanta, def. Emma Decoste, Stuart, Fla., and Ann Li (5), Devon, Pa., 6-2, 6-3. Sam Riffice and Michaela Gordon, both 16-year-old Northern Californians, suffered similar fates on Friday in the Orange Bowl in Plantation, Fla. The difference was that Riffice played two singles matches and Gordon one. The unseeded Riffice, from Roseville in the Sacramento area, lost to No. 2 Mate Valkusz of Hungary 6-2, 6-2 in the boys 18 quarterfinals of the prestigious clay-court tournament. The 12th-seeded Gordon, from Saratoga in the San Francisco Bay Area, fell to No. 7 Evgeniya Leveshova of Russia 6-3, 6-0 in the third round of the girls 18s. Leveshova then lost to No. 2 Dalma Galfi, the reigning U.S. Open girls champion from Hungary, 4-6, 6-3, 7-6 (5) in the quarterfinals. Two rounds in the boys and girls 18s were played on Friday because of rain early in the week. Riffice, last year's 16-and-under champion, had needed nearly three hours to turn back Toru Horie of Japan 4-6, 6-4, 7-6 (2) on Friday morning. Valkusz, 17, had defeated qualifier Rudolph Molleker of Germany 7-6 (3), 6-3 but has been battling an illness. Gordon and 15-year-old Keenan Mayo, Riffice's friend and neighbor in Roseville, reached the doubles semifinals in their respective draws. Gordon and Jaqueline Cristian of Romania dispatched Georgia Craciun and Oana Gavrila of Romania 6-3, 6-1 in a matchup of unseeded teams. Unseeded Mayo and Trey Hilderbrand of San Antonio eliminated fifth-seeded Juan Ignacio Batalla Diez of Mexico and Sergio Luis Hernandez Ramirez of Colombia 7-6 (3), 6-3 in the 16s. Mayo and Hilderbrand had knocked out top-seeded Jonas Eriksson Ziverts and Karl Friberg of Sweden in the second round. Sam Riffice of Roseville in the Sacramento area surprised No. 10 seed Jurabek Karimov of Uzbekistan 6-3, 6-3 on Thursday in the second round of the boys 18s in the Orange Bowl in Plantation, Fla.
Riffice, who trains at the USTA center in Boca Raton, Fla., won the boys 16 title last year at 15 years old. He is scheduled to play Toru Horie, 16, of Japan today for a quarterfinal berth in the clay-court tournament. Horie upset seventh-seeded Felix Auger-Aliassime of Canada 6-3, 6-4. Auger-Aliassime, 15, won last week's Eddie Herr International Tennis Championship in Bradenton, Fla. The winner of the match between Riffice and Horie will play again today, probably against No. 2 seed Mate Valkusz of Hungary, for a semifinal spot. No. 1 seed Casper Ruud, 16, of Norway edged Alexandar Lazarov, 18, of Bulgaria 4-6, 6-4, 7-6 (5). Ruud's father, Christian, climbed to a career-high No. 39 in the world in 1995. Riffice's friend and neighbor from Roseville, Keenan Mayo, lost to No. 1 seed Jonas Eriksson Ziverts of Sweden 6-2, 6-4 in the second round of the boys 16s. But Mayo and Trey Hilderbrand of San Antonio knocked off top seeds Eriksson Ziverts and Karl Friberg, also from Sweden, 6-4, 6-0 to become the only unseeded team in the doubles quarterfinals. Mayo trains at the USTA center in Carson in the Los Angeles region. Michaela Gordon, 16, of Saratoga in the San Francisco Bay Area had a big day in the girls 18s. Seeded 12th in singles, she beat Nina Kruijer of the Netherlands 6-4, 6-1. Then Gordon and Jaqueline Cristian of Romania ousted No. 4 seeds Charlotte Robillard-Millette and Katherine Sebov of Canada 6-2, 2-6 [10-4] to reach the doubles quarters. Gordon will face No. 7 seed Evgeniya Levashova of Russia today. The survivor will play later in the day, likely against No. 2 seed and reigning U.S. Open girls champion Dalma Galfi of Hungary, for a semifinal berth. Carolyn Campana of Hillsborough in the Bay Area lost to seeds in straight sets in the second round of girls 16 singles and doubles. Also in girls 16 doubles, Abigail Forbes of Raleigh, N.C., and Jessi Muljat, 14, of Sacramento fell to No. 4 seeds Ania Hertel of Poland and Mihaela Lorena Marculescu of Romania 4-6, 6-2 [14-12]. The Orange Bowl, the top junior tournament in the world outside of the Grand Slams, was founded by Eddie Herr in 1947. It was played on clay until 1998, then on hardcourts until 2011. It has been contested on clay again since then. Past winners of the Orange Bowl 18s include Chris Evert (1969-70), Bjorn Borg 1972), John McEnroe (1976), Ivan Lendl (1977), Gabriela Sabatini (1984), Mary Joe Fernandez (1985), Jim Courier (1987) and Anna Kournikova (1995). Winners of the tournament on hardcourts include Roger Federer (1998), Elena Dementieva (1998), Andy Roddick (1999), Vera Zvonareva (2000 and 2001), Marcos Baghdatis (2003) and Caroline Wozniacki (2005). Sam Riffice of Roseville in the Sacramento area defeated qualifier Andres Andrade of Ecuador 4-6, 6-3, 6-2 today in the completion of a suspended boys 18 first-round match at the Orange Bowl in Plantation, Fla.
Riffice, who won the 16s title last year at 15 years old, will face 10th-seeded Jurabek Karimov of Uzbekistan. Karimov demolished lucky loser Sean Huynh of Canada 6-1, 6-0. Riffice trains at the USTA center in Boca Raton, Fla. In the first round of the boys 16s, Jenson Brooksby of Carmichael in the Sacramento region lost to qualifier Luka Pavlovic of France 7-6 (5), 7-6 (3). Brooksby, 15, served for the second set at 5-4. Sofia Kenin, the top seed and defending champion in the girls 18s, fell to Olga Danilovic, a 14-year-old left-hander from Serbia, 6-0, 5-7, 7-5. No. 12 seed Michaela Gordon (girls 18s) of Saratoga in the San Francisco Bay Area, Carolyn Campana (girls 16s) of Hillsborough in the Bay Area and Keenan Mayo (boys 16s) do not play singles today after winning their first-round matches earlier in the week. Gordon, 16, reached the Wimbledon girls quarterfinals this year. Mayo, Riffice's childhood friend from Roseville, trains at the USTA center in Carson in the Los Angeles region. Mayo will take on second-seeded Jonas Ericksson Zeverts of Sweden. Campana will meet ninth-seeded Sohyun Park of South Korea. Sam Riffice, Roseville, def. Andres Andrade, Ecuador, 4-6, 6-3, 6-2. Keenan Mayo, Roseville, def. Palaphoom Kovapitukted, Thailand, 6-3, 6-2. Luka Pavlovic, France, def. Jenson Brooksby, Carmichael, 7-6 (5), 7-6 (3). Yuta Shimizu and Yunosuke Tanaka, Japan, def. Sam Riffice, Roseville, and Vasil Kirkov, Tampa, Fla., 7-6 (2), 6-3. Trey Hilderbrand, San Antonio, and Keenan Mayo, Roseville, def. Harrison Brown, Australia, and Vikash Singh, India, 6-3, 6-2. Charles Fischer Pinheiro and Gilbert Soares Klier, Brazil, def. Jenson Brooksby, Carmichael, and James Ignatowich, Delray Beach, Fla., 6-3, 7-5. Michaela Gordon (12), Saratoga, def. Maria Jose Portillo Ramirez, Mexico, 6-3, 6-0. Carolyn Campana, Hillsborough, def. Luniuska Delgado, Venezuela, 7-6 (5), 6-3. Eunhye Lee, South Korea, def. Jessi Muljat, Sacramento, 6-3, 6-0. Jaqueline Cristian, Romania, and Michaela Gordon, Saratoga, def. Isolde De Jong and Nina Kruijer, Netherlands, 6-3, 3-6 [10-7]. Abigail Forbes, Raleigh, N.C., and Jessi Muljat, Sacramento, def. Sandra Aguirre and Sofia Ayuso, Venezuela, 6-1, 6-1. Carolyn Campana, Hillsborough, and Jayci Goldsmith, Austin, Texas, def. Luniuska Delgado, Venezuela, and Mell Elizabeth Reasco Gonzalez, Ecuador, 7-6 (6), 6-3. The United States, featuring several players with Northern California ties, defeated host France 4-1 on Sunday in Rennes for its fifth straight championship in the Master'U BNP Paribas. Mackenzie McDonald, a UCLA junior from Piedmont in the San Francisco Bay Area, beat Gregory Jacq 6-4, 7-6 (tiebreaker score not available) at No. 1 men's singles. Cal's Maegan Manasse and Florida's Brooke Austin topped Alice Bacquie and Clemence Fayol 7-5, 6-1. Manasse fell to Victoria Larrier 6-2, 6-2 at No. 2 women's singles. The Americans opened the tournament with a 7-0 victory over Great Britain in the quarterfinals and followed with a 4-3 win over Germany. The U.S. team consisted of three men (McDonald, Tom Fawcett of Stanford and Austin Smith of Georgia) and three women (Manasse, Austin and Danielle Collins of Virginia). McDonald reached the semifinals of the $100,000 Tiburon (Calif.) Challenger and quarterfinals of the $100,000 Sacramento Challenger in October. Austin advanced to the semis of the $50,000 Sacramento Challenger in July, and Collins won the 2014 NCAA singles title. 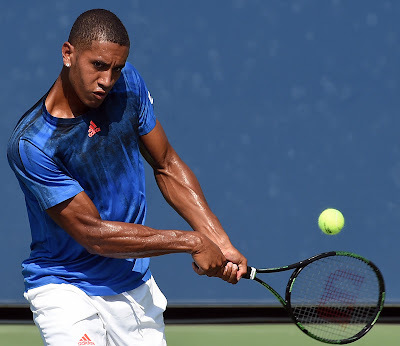 Felix Auger-Aliassime of Canada and Kylie McKenzie of Anthem, Ariz., completed stunning title marches on Sunday in the Eddie Herr International Championship in Bradenton, Fla. Saving three match points, the sixth-seeded Auger-Aliassime edged No. 4 Alex De Minaur of Australia 6-3, 6-7 (6), 7-6 (3) in the boys 18s. De Minaur, 16, served for the match at 5-4, 40-0 in the third set. Auger-Aliassime, 15, also survived three match points in his 2-6, 7-6 (8), 7-6 (2) victory over Alexandar Lazarov of Bulgaria in the third round. The unseeded McKenzie outlasted No. 5 seed Tamara Zidansek, 17, of Slovenia 3-6, 6-3, 6-4 in the girls 18s. McKenzie, 16, saved a match point in the third round and ousted No. 1 seed Dalma Galfi, the reigning U.S. Open girls champion from Hungary, in the semifinals. In March at 14, Auger-Aliassime became the youngest player to qualify for a main draw in ATP Challenger history. He won the U.S. Open boys doubles title with countryman Denis Shapovalov in September and led Canada to its first Junior Davis Cup title the following month in Spain. The Eddie Herr Championship is one of the most prestigious junior tournaments in the world. Past competitors include Roger Federer, Andy Roddick, David Nalbandian, Maria Sharapova, Jelena Jankovic and Ana Ivanovic. Many of the players in this year's Eddie Herr Championship will compete in this week's Orange Bowl, the most prestigious junior tournament in the world outside of the four Grand Slams, in Plantation, Fla. Heavy rain postponed the start of main-draw singles in every age group. 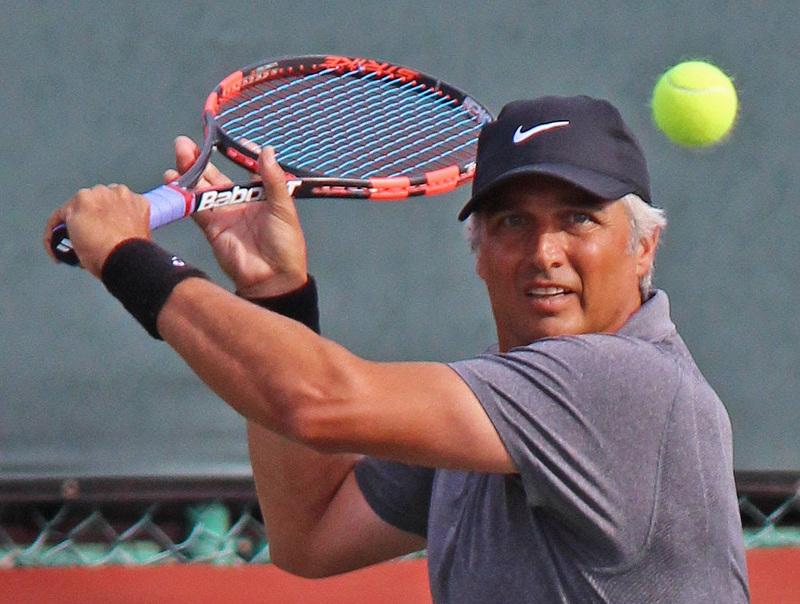 Tony Bujan claimed his third consecutive title in the USTA National 40 Hard Court Championships, but it was a struggle. The No. 1 seed, from Tustin in the Los Angeles area, No. 4 defeated Marcio Carlsson of Brazil 7-6 (4), 6-4 on Sunday in the San Diego suburb of La Jolla. Bujan, a three-time All-American at Texas Christian in the early 1990s, reached a career-high No. 477 in the world in 1994. He overcame a 5-2 deficit in the first set to become the first man to win three straight titles in the tournament since USC coach Peter Smith from 2005 to 2007. "I felt like I was the underdog today," Bujan, a 45-year-old teaching professional, admitted in a press release. "I didn't start well, but once I got my teeth into the match, I thought I was going to be OK. I was trying not to let him get into any rhythm. "I volleyed particularly well today. It came down to coming up with big serves and big shots on the big points." Carlsson, 40, climbed as high as No. 119 in the world in 1998 and had lost only four games in five matches in the tournament. Still, the surface favored Bujan. "He's Brazilian. He grew up on clay courts," Bujan noted. "I (wanted to) get it in on him, serve-and-volley, make it less of a running match and not let him hit those heavy groundstrokes." Unseeded Carolyn Campana of Hillsborough in the San Francisco Bay Area and Abigail Forbes of Raleigh, N.C., lost a heartbreaker in the girls 16 doubles final of the Eddie Herr International Tennis Championship. Campana and Forbes fell to top-seeded Selma Cadar of Romania and Ulyana Shirokova of Russia 6-4, 6-7 (6) [13-11] today in Bradenton, Fla. Earlier today, Campana and Forbes outclassed unseeded Kacie Harvey of Braintree, Mass., and Melissa Sakar of Lauderdale Lake, Fla., 6-3, 6-3 in the semifinals. Meanwhile, fifth-seeded Tamara Zidansek of Slovenia ended the surprising run of 14-year-old wild card Amanda Anisimova with a 0-6, 6-4, 6-1 victory in the girls 18 semifinals. Anisimova, from Hallandale Beach, Fla., had ousted seeds in her previous three matches. Among them were No. 11 Michaela Gordon of Saratoga in the Bay Area in the third round. Zidansek, 17, will play unseeded Kylie McKenzie, 16, of Anthem, Ariz., for the title. McKenzie beat top seed and defending champion Dalma Galfi of Hungary 6-4, 6-3. Galfi won the U.S. Open girls title in September. In a boys 18 semifinal, No. 6 seed Felix Auger-Aliassime of Canada took out No. 2 Stefanos Tsitsipas of Greece 7-5, 6-4. Auger-Aliassime will face No. 4 Alex De Minaur of Australia for the title. McKenzie saved one match point and Auger-Aliassime three in their third-round matches on Thursday. Both Northern California men lost today in the semifinals of the USTA National 40 Hard Court Championships in the San Diego suburb of La Jolla. No. 3 seed Oren Motevassel of San Jose fell to No. 1 Tony Bujan, the two-time defending champion from Tustin, 6-3, 6-4. No. 9 David Smith of San Francisco bowed out against No. 4 Marcio Carlsson of Florianopolis, Brazil, 6-2, 6-1. Carlsson, 40, has lost only four games in five matches. He reached No. 119 in the world in 1998. Bujan, a 45-year-old teaching pro in Orange County, was a three-time All-American at TCU in the early 1990s. Motevassel, 48, won the title in 2011 and 2012. He climbed to a career-high No. 161 in 1997. Unseeded Carolyn Campana of Hillsborough in the San Francisco Bay Area and Abigail Forbes of Raleigh, N.C., knocked off two seeded teams today to reach the girls 16 doubles semifinals in the Eddie Herr International Tennis Championship. Campana and Forbes surprised No. 8 Georgia Gulin of Brazil and Fernanda Labrana of Chile 7-5, 6-3 and then No. 2 Nicole Mossmer of La Jolla and Jessi Muljat, 14, of Sacramento 6-3, 6-1 in Bradenton, Fla.
Campana and Forbes will play unseeded Kacie Harvey of Braintree, Mass., and Melissa Sakar of Lauderdale Lake, Fla., on Saturday. Harvey and Sakar beat unseeded Meredith Jones of the Philippines and Renata Lombera of Mexico 6-2, 7-5. Neither of the semifinal teams has lost a set in three matches. Meanwhile, 14-year-old Amanada Anisimova continued her amazing run in girls 18 singles. The wild card from Hallandale Beach, Fla., ousted a third consecutive seed to move into the semis, defeating No. 11 Alexandra Sanford of Westerville, Ohio, 6-4, 6-2. Anisimova had beaten No. 7 Bianca Andreescu of Canada in the second round and No. 11 Michaela Gordon of Saratoga in the Bay Area in the third round. Anisimova will try to continue her streak when she meets No. 5 Tamara Zidansek, 17, of Slovenia. No. 1 Dalma Galfi of Hungary will play unseeded Kylie McKenzie of Anthem, Ariz., in the other semifinal. The boys 18 semifinals feature two Canadians. No. 6 Felix Auger-Aliassime will take on No. 2 Stefanos Tsitsipas of Greece, and No. 15 Benjamin Sigouin will meet No. 4 Alex De Minaur of Australia. It doesn't compare to beating Steffi Graf and Martina Hingis. But Amy Frazier will take it. 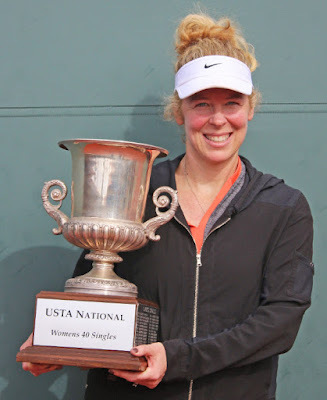 The top-seeded Frazier, from Rochester, Mich., routed second seed and defending champion Dina McBride of Stevenson Ranch 6-1, 6-3 on Friday for the women's title in the USTA National 40 Hard Court Championships in the San Diego suburb of La Jolla. Frazier defeated Graf in 1999 and Hingis in 2000 in an upper-level WTA tournament in nearby Carlsbad. Frazier was coming off a 6-4, 4-6, 6-2 victory over third-seeded Jennifer Dawson of Carlsbad in Thursday's semifinals. "Yesterday really helped me, having such a tough match," admitted the 43-year-old Frazier, who was playing in her first USTA national senior tournament since retiring from the pro tour in 2006. "Today I played the big points better. It was great. I had a really fun week. It was a fun event, and everyone was so nice. I'm thrilled. It was kind of special that my husband and my daughter were here." Frazier won eight singles and four doubles titles on the WTA tour. She reached two Grand Slam quarterfinals and a career-high No. 13 in the world. Two Northern California men are scheduled to play in today's semifinals. No. 3 seed Oren Motevassel of San Jose will face top seed and two-time defending champion Tony Bujan of Tustin, and No. 9 David Smith of San Francisco will play No. 4 Marcio Carlsson of Las Vegas. Motevassel, 48, won the title in 2011 and 2012. He climbed to a career-high No. 161 in the world in 1997. Bujan, a teaching pro in Orange County, was a three-time All-American at TCU in the early 1990s. David Sanderlin, El Cajon, and Dylan Taylor, Huntington Beach, def. Paul Kepler, Aptos, and Devan Kepler, Kahului, Hawaii, 6-4, 6-4. Nicklaus Vogt, Rossmoor, and Charles Vogt, North Ogden, Utah, def. Robert Quall, Merced, and Drew Quall, Clovis, 2-6, 6-4, 6-3. The next five to 10 years are going to be mighty interesting in U.S. men's tennis. You remember the United States, right? Used to be pretty good in men's tennis. Cranked out Hall of Famers the way John Grisham does bestsellers. Twenty years ago, had the top two players in the world (Pete Sampras and Andre Agassi), three of the top five (including Michael Chang) and four of the top eight (with Jim Courier). Collected Davis Cups the way Meryl Streep racks up Oscar nominations. Eclipsed by Spain, Switzerland, Serbia, Great Britain, Canada and Burkina Faso. Doing about as well as Detroit. Hasn't won a Grand Slam singles title since Harry Potter was in his fifth year at Hogwarts (2003). Hasn't won a Davis Cup since the U.S. economy was thriving (2007). Has no one in the top 10 and one player, No. 11 John Isner, in the top 25. Sure, the Bryan brothers have won a record 16 Grand Slam men's doubles titles, but because the top singles players rarely play doubles and it consequently receives little television exposure, few care. There's hope for the United States, though. A lot of it. Jack Sock, 23, and Steve Johnson, 25, are rising in the rankings at No. 26 and No. 32, respectively. Sock already owns two Grand Slam doubles titles: men's doubles with Vasek Pospisil of Canada at Wimbledon last year and mixed doubles with countrywoman Melanie Oudin in the 2011 U.S. Open. And behind Sock, who turned pro out of high school, and Johnson, who led USC to four NCAA titles, comes a wave of top U.S. teenagers. "I think the next generation is going to be huge," one of them, Stefan Kozlov, told The New York Times last year. "And I think it's coming soon, to be honest." That would buck a trend of players peaking between 25 and 30 in today's physical game (translation: courts are slower, which means more rallies, which means higher television ratings, which means more money). Still, the United States has more top prospects than at any time in memory. It began with a trickle in December 2013 when 15-year-old Frances Tiafoe became the youngest boy to win the Orange Bowl, the most prestigious junior tournament in the world outside of the Grand Slams. The trickle became a stream last year when Noah Rubin, then 18, defeated Kozlov, 16 at the time, in the first all-American boys singles final at Wimbledon since 1977. Then Kozlov, playing with a sore elbow, became the third-youngest American to reach a final on the Challenger tour (equivalent to Triple A in baseball). This year, a deluge of promising U.S. teens has struck. The prospects have dominated Grand Slam junior tournaments and U.S. fall Challengers, and one qualified for the men's singles draw in the U.S. Open. Three different Americans have won the last three Grand Slam junior singles titles: Tommy Paul (French), 6-foot-11 (2.11-meter) Reilly Opelka (Wimbledon) and Taylor Fritz (U.S. Open). In fact, only once in those tournaments has a non-American reached the final. Paul defeated Fritz to join McEnroe (1977) and Bjorn Fratangelo (2011) as the only Americans to win the French Open boys title. It was the first all-American final in the 68-year history of the junior boys event. Opelka topped Mikael Ymer of Sweden at Wimbledon, and Fritz beat Paul in the U.S. Open. Earlier in the U.S. Open, Paul became the only American to emerge from men's qualifying. He lost to 25th-seeded Andreas Seppi, an Italian veteran who stunned Roger Federer in the third round of the Australian Open in January, in straight sets in the first round of the main draw. Fritz won back-to-back Northern California Challengers in Sacramento ($100,000) and Fairfield ($50,000) in October and reached the final of last month's $50,000 Champaign (Ill.) Challenger. He became the ninth boy to win multiple Challenger titles before his 18th birthday. Sacramento, where Fritz outlasted Jared Donaldson 6-4, 3-6, 6-4 for the title, marked one of two recent all-U.S. teen Challenger finals. Rubin, a qualifier, saved two match points to beat Paul last month in a $50,000 tournament in Charlottesville, Va., for his first Challenger title. In the following two weeks, Tiafoe and Fritz advanced to the finals of $50,000 Challengers in Knoxville, Tenn., and Champaign, Ill., respectively. Meanwhile, three of the top four juniors in the International Tennis Federation's world rankings and four of the top 10 are American. Fritz is No. 1, followed by No. 3 Paul, No. 4 Opelka, and No. 10 Michael Mmoh (who was No. 2 in September before playing exclusively in pro tournaments). "I think (the future) looks good with everyone coming up because it's so deep," Fritz said in Sacramento. "There's not just one or two. There's a lot of people who can do well, and I think we're going to push each other. In the end, that's going to help us all." Denis Kudla, the only U.S. man to reach the second week of Wimbledon this year, agreed with Fritz about the young Americans. "This game is so mental. Some people don't understand how mental it is. I think it's more mental than it is ball-striking. Everyone can hit the ball well, but if you play every single point and you're there mentally, you'll shock yourself how many matches you can win. The guy who's tougher mentally will beat a better ball-striker most of the time. That's the biggest thing, and obviously being in incredible shape because the game is so physical now." The USTA, faced with mounting criticism, intensified its player development efforts six years ago under general manager Patrick McEnroe. He announced in September 2014 that he was leaving the job after 6 1/2 years, and Martin Blackman was named as McEnroe's successor last April. Both are former Stanford players; Blackman is four years younger at 45. "We've been working a lot with this generation since they were 12, 13 years old and even before," Diego Moyano, a USTA lead national coach, said in Sacramento. "At the USTA, we've been putting a lot of attention on developing that generation and even the next one. We try to recognize talent at young ages and start working really hard helping parents and private coaches to develop them the best way we can. We started like six years ago, and we start seeing some of the results right now. It's a process that takes time. "We've been very strict on their development and are trying to push them to get better every day. So far, we are on the right track. Now we go to the next step, which is a very tough moment, the process of going from the best juniors to the best pro players they can." Indeed, success in juniors and Challengers guarantees nothing. Ten years ago, the Grand Slam junior boys champions were American Donald Young (Australian Open), Croatia's Marin Cilic (French Open), France's Jeremy Chardy (Wimbledon) and American Ryan Sweeting (U.S. Open). Cilic, last year's U.S. Open champion, is the only one to have reached a Grand Slam men's semifinal. Sweeting is best known as the estranged husband of "Big Bang Theory" star Kaley Cuoco. The record holder for most season singles titles on the USTA Pro Circuit, of which Challengers are the highest level, is American Ben McKown with seven in 1980. Remember him? Didn't think so. The good news for the United States is that in five years, Roger Federer will be 39, Rafael Nadal 34, and Novak Djokovic and Andy Murray 33. The bad news is that four teenagers from around the world are far ahead of the Americans. Borna Coric, 19, of Croatia is ranked 44th and already owns victories over Nadal and Murray. Two other 19-year-olds, Hyeon Chung of South Korea and 6-foot-5 (1.96-meter) Thanasi Kokkinakis of Australia, are ranked 51st and 80th, respectively. Six-foot-six (1.98-meter) Alexander Zverev, an 18-year-old German, is No. 83. The highest-ranked U.S. teenager is the 19-year-old Donaldson at No. 135. The U.S. teens come from diverse, and in many cases unusual, backgrounds. All have turned pro, and all but Mmoh have played in the Sacramento Challenger in the past three years. Tiafoe, Opelka and Paul, in addition to Fritz and Donaldson, competed there in October. Kozlov made his run last year, and Rubin appeared briefly two years ago. Pedigree, power and poise -- Fritz appears to be the whole package. His mother (Kathy May), father (Guy Fritz) and uncle (Harry Fritz) all played professionally. May climbed to No. 10 in the world and played in three Grand Slam quarterfinals. Guy is one of Taylor's coaches. Fritz's serve is reminiscent of -- dare we say it? -- his idol Pete Sampras'. Taylor's parents weren't pushy, though. When asked the most important advice they have given him, Fritz said revealingly, "Have fun." Nor was Taylor needed as a cash cow. May comes from the family that started the May Company, a chain of Southern California department stores that merged with J.W. Robinson's in 1993 and Macy's in 2006. Fritz, from Rancho Santa Fe in the San Diego area, went to the USTA center in Boca Raton, Fla., two years ago to train. "When I first went there, there were like 16 kids, and I was the worst," Fritz said on espn.com. "There were 16 Americans, and I couldn't beat anyone. I was the worst one there. I just remember realizing that and thinking, 'Wow, I'm not as good as I thought I was.' Then I just was working insanely hard." Fritz developed a smooth, easy service motion reminiscent of -- dare we say it? -- Sampras'. That's no concidence; Sampras is Fritz's idol. "Just because he's a big-serving guy, a powerful player," the 6-foot-4 (1.93-meter) Fritz said of his fellow Southern Californian after winning the Fairfield title. "I just really like his game style. Most people think he's the best American tennis player of all time. I try to model my serve after him, too." Fritz, who turned 18 on Oct. 28, showed an uncanny ability to play his best under pressure en route to his titles in Sacramento and Fairfield. He saved three match points and 13 of 14 break points in his 6-7 (3), 7-6 (5), 7-6 (7) victory over third-seeded Dustin Brown, 30, in the second round in Sacramento. Fritz then disposed of Brown in 57 minutes for the Fairfield title. Brown stunned Nadal on Center Court in the second round at Wimbledon this year to improve to 2-0 lifetime against the 14-time Grand Slam singles champion. Fritz escaped 15 of 16 break points in his 6-4, 3-6, 6-4 win over Donaldson in the Sacramento final and 13 of 14 in his five Fairfield matches combined. Matt Reid, a 25-year-old Australian, is 1-1 against Fritz. Reid won 6-4, 3-6, 6-3 in the first round of a $10,000 Futures tournament in Costa Mesa in Southern California in September 2014, when Fritz was 16. Fritz triumphed 6-3, 7-6 (4) in the Sacramento semifinals in October. Reid recently recalled his first match against Fritz. "He was unknown to me back then," Reid admitted recently in Sacramento. "I thought it was going to be a great draw, but it was an absolute battle. I told him after the match he was going to be a great player, and he's already No. 1 in the world in the juniors, so he's started pretty quick. "On big points, he just came up massive. He believed in himself. Massive serve, massive forehand, and he kept calm the whole time. I thought straight away he was going to be really good, and sure enough, he's killing it in the juniors. It's good to see." That was before Fritz won the two straight Challengers and reached another final to rise to No. 177 in the world. Eight weeks ago, he was No. 694. It's a classic rags-to-(potential) riches story. As an emigrant from Sierra Leone in West Africa in the late 1990s, Constant Tiafoe took a job helping to build the Junior Tennis Champions Center in the Washington, D.C., suburb of College Park, Md., Sports Illustrated reported in June 2014. His twin sons, Frances and Franklin, hung out in a 140-square-foot room at the center and started to play tennis at age 3 or 4. Frances couldn't get enough of the game and developed quickly. "I've had my eye on Tiafoe for a long time," said Kudla, who grew up in Arlington, Va., in the Washington, D.C., area. "We come from the same club, and I've known him since he was 4 years old. He's an incredible talent. He has so much going for him. He has a huge upside. "His ball-striking and physical abilities are pretty incredible. He's an incredible mover, he reads the game so well, and he has every shot in the book. All he needs to get to the highest level is his mind, to be able to control his emotions and learn how to play this game the right way. He has all the talent in the world." Tiafoe, the youngest of the group at 17 (he was born 10 days after Mmoh), has skyrocketed from No. 816 in March to No. 180. He reached the semifinals in Fairfield and held two match points in a 4-6, 7-5, 7-6 (7) loss to the fourth-seeded Smyczek in the first round in Sacramento. After that match, Smyczek compared the 6-foot-2 (1.88-meter), 170-pound (77-kilogram) Tiafoe with Donaldson and Kozlov. "It's a little different style," said the 5-foot-9 (1.75-meter) Smyczek, who's 1-0 lifetime against Tiafoe, 3-2 against Donaldson and 2-1 against Kozlov. "He's miles ahead of those two physically. He's built like an ox. He's really fast but maybe a little less disciplined than a Donaldson and maybe doesn't have quite the same feel as a Kozlov. But he's an unbelievable shotmaker, and he doesn't lack in confidence. All three of those kids have a lot of confidence." Tiafoe, with his loose wrist, has an unorthodox yet overpowering serve and forehand. His two-handed backhand is a weapon, too. His biggest issue is a volatile temper. "I really want to be a top-10 pro, dominate the game and hopefully win a Grand Slam," Tiafoe said in October during the Sacramento Challenger. "Obviously, that's everyone's goal, but I really think I can do that, and I work toward that every day I step on the practice court. I give it my all every day." Donaldson has always been an outsider. He grew up in Rhode Island and trained on clay in Argentina for 2 1/2 years in his early teens. He works with the father-son team of former pro players Phil and Taylor Dent in Irvine, Calif., rather than with USTA coaches. Why did Donaldson trek to Argentina? Why not go to Florida? "We looked into Florida and Spain, but I had a connection to Argentina through one of my coaches in Rhode Island," Donaldson -- who lived in Buenos Aires with his father, Courtney -- explained recently in Sacramento. "He lined up a coach and a place to stay. We took the risk and went down there, and I had a really good experience." Donaldson returned to the United States in early 2013. Eighteen months later, he reached his first Challenger semifinal, losing to Smyczek 3-6, 6-4, 6-3 in Napa. Afterward, Smyczek said the 6-foot-2 (1.88-meter) Donaldson has "a lot of potential. He's got a couple of big weapons (the serve and forehand), but the main thing is he's so solid with everything he does. You don't see that very often in a player his age. "Usually, good players his age have a glaring weakness, and he doesn't. He could be a heck of a player. He already is. If he keeps working hard -- he's got a great coach in Taylor Dent -- the sky's the limit. He's a great talent." Donaldson has a devastating flat forehand and two-handed backhand. After the seventh-seeded Donaldson's 6-3, 2-6, 6-4 victory over the top-seeded Kudla in the Sacramento semifinals in October, Kudla aptly said Donaldson "was lasering winners left and right. I did everything I could. ... "
Though calmer than Tiafoe, Donaldson also might need to curb his emotions. Midway through the first set of the Sacramento final, he alienated the crowd by arguing with the chair umpire about line calls. Two nights before the start of qualifying for the recent Sacramento Challenger, tournament director Brian Martinez heard a loud pop on one of the courts. It was Opelka practicing with Paul. "He was just crushing forehands," Martinez recalled. "Very relaxed, very easy. ... He's like a young Isner who moves better. He has a better backhand than Isner does." Opelka, 18, has a huge upside, but at his height probably will take longer to develop than his peers. He's ranked only No. 975. "As tall as (Opelka) is, he's a very good athlete," Moyano stated. "He moves really well. He has a massive serve. Technically from the ground, he's very good. "As tall as he is, obviously there are more pieces to put together, but he understands that. He's working on his baseline game as well as his net game. That's something he needs to improve and understand -- how to move to the net and maybe accept that he's going to miss a little bit more than the other guys (from the baseline)." Denmark's Frederik Nielsen, who won the 2012 Wimbledon men's doubles title with Jonathan Marray of Great Britain, beat Opelka 6-2, 6-4 in the second round of Sacramento qualifying in October. "With a serve like (Opelka's) and you're already at (the Challenger) level, you have great potential," Nielsen observed. "The top hundred is a given. From there, I find it very difficult to tell what separates the guys. The next few years will show mentally what it takes (for him) to get to the next level." As with the 6-foot-10 (2.08-meter) Isner and 6-foot-11 (2.11-meter) Ivo Karlovic, the racket looks like a Ping-Pong paddle in Opelka's hands. Isner, a 30-year-old product of Greensboro, N.C., reached a career-high No. 9 in 2012. Karlovic, a 36-year-old Croatian, climbed as high as No. 14 in 2008. Whereas Isner played at the University of Georgia for four years, Opelka turned pro in April at 17. En route to becoming the only wild cards to win the Wimbledon men's doubles title, Nielsen and Marray dominated Karlovic and 6-foot-5 (1.96-meter) Frank Moser of Germany 6-3, 6-3, 6-2 in the second round. "Karlovic has a better serve (than Opelka)," Nielsen asserted. "Opelka is better from the backcourt, especially at this age. Right now, Ivo is very good from the back, but at that age, he wasn't. "It's important for Opelka to be ambitious on his second serve. I felt his second serve was a little to predictable." Karlovic and Isner both have reached one Grand Slam singles quarterfinal, their best result in a major. Can Opelka, who was born in Michigan and moved with his family to Palm Coast, Fla., (near Daytona) at age 4, become a threat to win a Slam? "It's very difficult for me to say," Nielsen cautioned. "You can see even guys with big serves -- Isner and Karlovic -- none of them have really made a run in a Grand Slam yet, so it takes more than that. The game is getting more and more physical. The baseline game is very important. People have such good defense and counter-attacking abilities, it takes a lot more (than a big serve). It takes a lot of willpower; it takes a lot of mental strength. "I don't know (about Opelka's chances to win a Slam). Stranger things have happened." With his powerful serve and outrageous physical ability, the 17-year-old Mmoh has been compared to former world No. 7 Gael Monfils of France. "Michael is one of the most athletic people you will ever see on a tennis court," Opelka, a close friend of Mmoh's, told The New York Times in September. "There is nothing he can't do out there." --Reached the boys semifinals of the Australian Open and French Open. --Hit with Novak Djokovic at Wimbledon. --Won two U.S. Futures titles. --Advanced to the quarterfinals of the $50,000 Las Vegas Tennis Open in October, dispatching countryman and former top-50 player Ryan Harrison, 6-2, 6-3 in the first round before losing to eventual champion Thiemo de Bakker. --Jumped from No. 659 in January to No. 456. Mmoh is a one-man United Nations. He was born in Saudi Arabia to Tony Mmoh, a former journeyman professional and Olympian from Nigeria, and Geraldine O'Reilly, an Irishwoman who also holds Australian citizenship. Tony was coaching the Saudi Arabian Davis Cup team, and Geraldine, an avid tennis fan, was working in Saudi Arabia as a nurse at the time, the Times reported. Michael was named after Michael Jordan. Tony became infatuated with the NBA legend while attending St. Augustine's College (now St. Augustine's University) in North Carolina and becoming a U.S. citizen. Michael moved from Saudi Arabia to Bradenton, Fla., at 12 to train at the IMG Academy and still is based there. Although Mmoh plays for the United States, he could choose to represent Nigeria, Ireland, Australia or perhaps Saudi Arabia. After overpowering Kozlov 6-3, 6-4 to win last year's Sacramento Challenger, U.S. Davis Cup veteran Sam Querrey predicted stardom for the 16-year-old phenom. "He's got every shot in the book," declared the 6-foot-6 (1.98-meter) Querrey, who ascended to a career-high No. 17 in 2011. "If he keeps on the path he's on, he can be a top-10 player one day." Kozlov had earned his first win over a top-100 player in the semifinals, edging the second-seeded and 99th-ranked Smyczek 3-6, 6-3, 7-6 (1). Smyczek assessed Kozlov's game afterward. "He plays a real unconventional style ... " Smyczek observed. "He uses the slice a lot -- (including on) the forehand, which you don't see much -- and he's good at sneaking into the net and knocking volleys off. You don't see the variety that he brings very much." Three weeks before the tournament, commentator and U.S. Davis Cup captain Courier discussed Kozlov on Tennis Channel. "USTA coaches have been talking to me about Kozlov for three years," Courier revealed. "His biggest asset is his mind. He's a very crafty player with a lot of variety. He'll be in the top 50 by the time he's 20." Kozlov and his younger tennis-playing brother, Boris, were named after Stefan Edberg and Boris Becker, respectively. Stefan was born in Macedonia and moved to South Florida with his Russian parents when he was 1. His father, Andrei, runs the Kozlov Miami Tennis Academy in Pembroke Pines, Fla.
"We don't live in the biggest house or have the nicest cars," Kozlov, who turned pro at 14, said after shocking Smyczek. "We grind day by day. If I do well here, I'm earning money for my family and my brother so he can travel to tournaments. I'm not playing for myself. I'm playing for my family. I'm playing for a lot of things." Since last year's breakthrough in Sacramento, the 6-foot (1.83-meter) Kozlov has improved from No. 443 to No. 353. He did not return to California's capital this year, opting for a series of Futures tournament in Europe. Kozlov recorded his second career win over a top-100 player three weeks ago, routing then-No. 97 Malek Jaziri of Tunisia 6-1, 6-2 in the first round in Knoxville before losing to Dennis Novikov of Milpitas in the San Francisco Bay Area in the second round. Rubin, 19, grew up playing at the John McEnroe Tennis Academy in the New York area. McEnroe has said Rubin, only 5-foot-10 (1.78 meters) and 155 pounds (70 kilograms), has top-50 potential "at a minimum." As a 17-year-old wild card, Rubin lost in the first round of the 2013 Sacramento Challenger to Smyczek, the second seed and eventual runner-up to Young, 7-6 (3), 6-0. Rubin turned pro in May after reaching the NCAA final as a freshman at Wake Forest. He has catapulted from No. 1,050 in June to No. 340 and won the recent Australian Open Wild Card Challenge by amassing the most points among Americans in two of three events (Charlottesville, Knoxville and Champaign). Rubin earned a wild card in the Australian Open in January when Fritz lost to Henri Laaksonen of Switzerland in the Champaign final two weeks ago. "It's probably the first time I had to rely on somebody else to lose for me to win, in a match I had nothing to do with," Rubin, who made his Grand Slam debut in the 2014 U.S. Open and lost in the first round as a wild card, told atpworldtour.com. "I didn't expect that outcome, but I'm excited to see what's going to come in the future. I've never been to the Australian Open before, even for juniors. I'm going to have to get acclimated to the temperature for sure, but I'm just excited about going there. "The goal is to have no goals. Anything can happen so quickly. It's just about having the mindset of being open and ready for anything. I was ranked No. 1,000 going out of school, and now I'm around No. 350 In a couple tournaments, I could be No. 250. It could happen so quickly. Just be ready for anything." Kudla defeated the 6-foot-2 (1.88-meter) Paul 6-4, 6-2 in the second round in Sacramento in October but raved about him afterward. "He hits an unbelievably big ball," Kudla marveled of the 18-year-old Paul, who has soared from No. 610 in May to No. 274. "We played in Cincinnati (in August, with Kudla winning by the odd score of 6-2, 0-6, 6-0), and I already feel like he's improved since then. It was a different scoreline, but still, he has every single shot. For him, it's a matter of keeping his game a little more organized. Then I think he can shoot through the rankings (to the top 100) pretty quick. "He's a little erratic out there. Some of his shots have no purpose. When those are landing in, great, but a lot of times against a higher-ranked player, they get those back, it's a little tough, and you don't really know what else you can do." Paul, who grew up playing on clay in North Carolina, insists that repeated reminders of the United States' Grand Slam drought don't bother him. Paul noted that he and the other U.S. prospects "all know it, definitely, but I'm not getting tired of it because it kind of pushes all of us to see how good we can get and see if one of us can maybe do it one day." Labels: Donaldson, Fritz, Kozlov, Mmoh, Opelka, Paul, Rubin, Tiafoe, U.S.